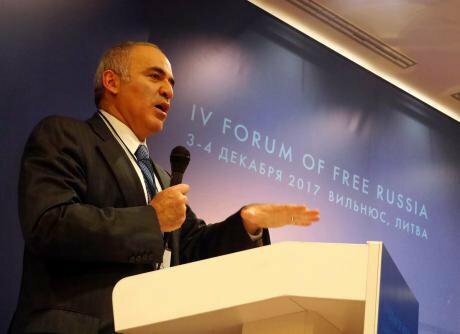 Garry Kasparov - one of the organizers of the "Free Russia Forum". Photo(c): Andrei Kalikh. All rights reserved.In early December, Vilnius once again hosted the fourth Free Russia Forum. This, the Russian opposition’s main annual get-together, is normally described by the pro-Kremlin media as a fugitive émigré coven, but is nothing of the sort. A good half of the participants actually reside in Russia, but there is a compelling reason for holding the Forum elsewhere – it just wouldn’t be allowed to happen at home. Like-minded people criticise the Forum for trying to bring together oppositionists of all hues (it is attended by Democrats, left-wingers and Russian ultra nationalists). This means that it rarely arrives at any concrete conclusions: people come, argue and go home again, giving the media an excuse for further criticism in its wake. I shall therefore refrain from analysing panel sessions with titles such as “The Putin Regime in the International Arena”, “Russia caught on the FSB’s Hook” and “The Centenary of the October Disaster”. Their speakers – academics, politicians and journalists – did an excellent job of describing the place and role of today’s Russia in the international political sphere. I would rather concentrate on the Forum’s “product” – the concrete recommendations for further opposition activity that came out of it. Three other discussions were devoted to these questions: fighting the Kremlin’s propaganda machine; what to do about the forthcoming elections and the possibility of further sanctions. The forum began with the traditional Russian game of “Avoid the propagandist”. To get into the auditorium where the sessions took place, delegates had to run the gauntlet of reporters and Russian TV crews milling around in the foyer. The security people wouldn’t let these into the auditorium, so people with cameras and microphones squeezed up to this or that delegate outside, hoping for a picture and a soundbite. 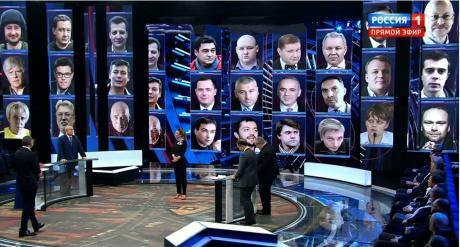 "Enemies of the people" according to the version of Rossiya TV channel. Screenshot Rossiya TV.In fact, correspondents from opposition media such as RFERL, Kasparov.Ru, Grani.ru and some local Lithuanian- and Russian-language outlets reported on the sessions, although, surprisingly enough, Yerofeyeva’s interview with Tyutrin didn’t make the cut. Her package was, however, used in the Rossiya TV channel’s “60 Minute” programme about the “Russophobe party in Vilnius”, against a backdrop of photos of “enemies of the people”. 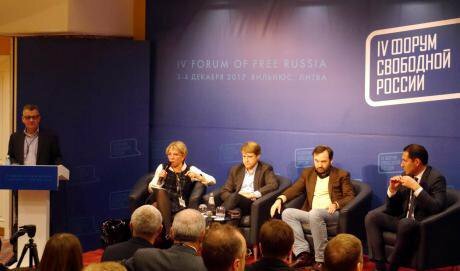 But while the state TV channels’ reporters were buttonholing delegates in the foyer, other journalists were in the auditorium, kicking the forum off with a discussion on how to combat the Kremlin propaganda machine. Elena Lukyanova speaks at a session on the tactics of the opposition in the elections. Photo(c): Andrey Kalikh. All rights reserved.At the same time, Russia’s opposition comes up against a wall of incomprehension when it tries to convince western politicians of the need to limit the influence of their country’s propaganda. Westerners see their demands as an attack on media freedom and are very slow to react to virtual danger. Reitschuster believes that there is a long, laborious road ahead of us, if we are to explain to western societies and politicians the harm that propagandist media are bringing to the world, and that this has nothing to do with media freedom. He is however unclear about whether we could ever match Putin’s success in this field. Yelena Lukyanova, a legal specialist and professor at Moscow’s Higher School of Economics, announced at the same session that she was working with Sobchak’s campaign staff and was also a member of Aleksey Navalny’s Progress Party’s think tank. She saw, she said, “no cognitive dissonance here” and would support “all the young, clever, candidates and both Ksyusha and Lyosha” [the usual diminutive pet names for “Ksenya” and “Alexey”]. This last remark sounded like an attempt at compromise with the majority of the people at the forum, who were strictly against any participation in the election and had condemned “Ksyusha and Lyosha” because of Putin’s concurrence in their legitimisation. In the end, their position came out on top: a majority of the forum voted to boycott the forthcoming presidential election. The oppositionists also announced another, unexpected boycott, of the 2018 Football World Cup taking place in Russia, which I can only explain by some passionate inertia that had collectively taken hold of the forum after they had made the decision about the first boycott. Russia’s weak and divided opposition will have as little effect on the election as on combating propaganda – it doesn’t have access to the country’s mass mediaBe that as it may, Russia’s weak and divided opposition will have as little effect on the election as on combating propaganda – it doesn’t have access to the country’s mass media. Western countries’ sanctions against Russian corporations and individuals are another matter. The opposition can have an effect on the character of the sanctions and the list of those affected by it: when compiling such lists, western governments consult with a wide variety of groups of independent experts and investigative journalists. One of the founders of the Free Russian Forum, Andrey Illarionov, was an economic advisor to President Putin between 2000 and 2005 and is now a senior fellow in the Center for Global Liberty and Prosperity at the Cato Institute in Washington, DC. He is a member of one such think tank, set up by the Atlantic Council, as is another prominent Russian political writer and analyst, Andrei Piontovsky, who is also now based in the USA. The forum’s “Sanction” session was organised in the run up to a new Congress List to be passed in the USA in February 2018; consultations on this are currently taking place in the American legislature. According to Illarionov, the Americans cite the following as reasons to compile a new list: continuing infringement of human rights in Russia, its aggressive external politics and interference in US elections. It could be called (in contrast to the sanctions introduced by the US and the EU after the annexation of Crimea and the start of the war in Donbas) the first purely anti-kleptocracy list, as it is expected to include names from the inner circle of the most influential oligarchs who use their closeness to President Putin to enhance their super-profits. The session also introduced an initiative from the forum itself, the “’Putin List’ Civil Project”. The list is already impressive in terms of its length and scope: it contains around 200 names divided into 12 categories – from “Leaders” and “Doers” to “Songbirds” and “Foreign Agents”. As you can guess, the “songbirds” are the Kremlin propagandists, while the “Foreign Agents” section includes, in its compilers’ elegant description, “the members of the International Putintern, as well as activists of the 'Putinversteher' club” – Gerhardt Schroeder, Silvio Berlusconi, Miloš Zeman, Marine le Pen and so on. A separate category of “gilded youth” has been set up for children, relations and close members of Putin’s inner circle, “who have received considerable assets from them”: they include Putin’s daughters, sons-in-law and other relatives and cronies such as the children of the Rotenberg brothers, as well as a certain “A. Kabayeva”, thef ormer gymnast who has frequently been rumoured to be in a relationship with Vladimir Putin. It was proposed that everyone attending the forum continue to work on their own on the “Putin List”, so that it can be presented to Congress next month. The Free Russian Forum sanctions list may be a little absurd, but the compilation of its own database on the Putin kleptocracy is an important step, marking a change from words to deeds. Along with the adoption of the first collaborative documents to appear in four forums, including, for example, a boycott of the presidential election, it represents the start of a slow process of consolidation of the most active, but also most divided, part of the Russian opposition.